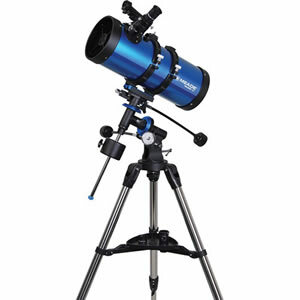 Designed for intermediate users, the Polaris 70mm f/12.9 Equatorial Refractor Telescope from Meade is intended to take astronomic observation to the next level by providing a complete set up for viewing the Moon and planets, and brighter deep-sky objects like star clusters and galaxies. Three eyepieces provide 34.6x, 100x, and 143x magnifications with a 2x Barlow lens that doubles the magnification of each eyepiece for a wider-range of observing possibilities. Its manual German equatorial mount has precise Right Ascension (RA) and Declination indicators to find your subjects and dual slow-motion cables for tracking. As a more advanced mount, it allows users to find just about any visible object by just knowing its coordinates. After the scope has been properly Polar Aligned, and the subject found, it can be easily tracked by making slight adjustments to the RA axis. The included AutoStar Suite Astronomer Software is a particularly useful tool for planning observation sessions. It is loaded with more than 10,000 celestial objects including planets, stars, galaxies and nebulae, and star charts can be printed for use in the field. An adjustable-height stainless steel tripod provides a stable platform for sky-watching, and the included red-dot finder makes polar-alignment faster and it's an easy tool for quick observations. An included 90° erect-image diagonal makes looking through the scope more comfortable, especially when aiming the telescope toward the zenith. The diagonal's prism corrects images horizontally and vertically, allowing the scope to be used for terrestrial viewing as well. An integrated dew-shield helps to prevent condensation on the objective lens, while blocking stray peripheral light from interfering with celestial observations. Designed for intermediate users, the Polaris 80mm f/11.3 Equatorial Refractor Telescope from Meade is intended to take astronomic observation to the next level by providing a complete set up for viewing the Moon and planets, and brighter deep-sky objects like star clusters and galaxies. Three eyepieces provide 34.6x, 100x, and 143x magnifications with a 2x Barlow lens that doubles the magnification of each eyepiece for a wider-range of observing possibilities. 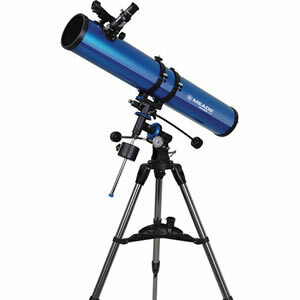 Designed for intermediate users, the Polaris 90mm f/10.0 Equatorial Refractor Telescope from Meade is intended to take astronomic observation to the next level by providing a complete set up for viewing the Moon and planets, and brighter deep-sky objects like star clusters and galaxies. Three eyepieces provide 34.6x, 100x, and 143x magnifications with a 2x Barlow lens that doubles the magnification of each eyepiece for a wider-range of observing possibilities. Designed for the intermediate-level user, the Polaris 114mm f/1000 Equatorial Reflector Telescope from Meade is designed to take astronomy to the next level by providing a complete set up for viewing the planets and deep-sky objects like galaxies, star clusters, and nebulae. Three eyepieces provide 38.5x, 111x, and 159x magnifications with a 2x Barlow lens that doubles the magnification of each eyepiece for a wider-range of observing possibilities. Its manual German equatorial mount has precise Right Ascension (RA) and Declination indicators to find your subjects and dual slow-motion cables for tracking. As a more advanced mount, it allows users to find just about any celestial object by just knowing its coordinates. After the mount has been properly Polar Aligned, and the subject found, it can be easily tracked by making slight adjustments to the RA dial. The included AutoStar Suite Astronomer Software provides a useful tool for planning observing sessions. It can show more than 10,000 celestial objects including planets, stars, galaxies and nebulae, and star charts can be printed for use in the field. 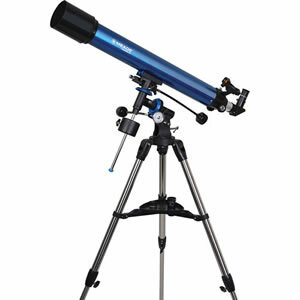 An adjustable-height stainless steel tripod provides a stable platform for sky-watching, and the included red-dot finder makes polar-alignment faster and is an essential tool for quick and easy observation sessions for easy to identify subjects such as the Moon, planets, and constellations. Tripod minimum height: 39.5", maximum height: 54"
Designed for the intermediate-level user, the Polaris 127mm f/1000 Equatorial Reflector Telescope from Meade is designed to take astronomy to the next level by providing a complete set up for viewing the planets and deep-sky objects like galaxies, star clusters, and nebulae. Three eyepieces provide 38.5x, 111x, and 159x magnifications with a 2x Barlow lens that doubles the magnification of each eyepiece for a wider-range of observing possibilities. 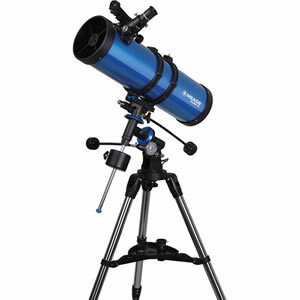 Designed for the intermediate-level user, the Polaris 130mm f/650 Equatorial Reflector Telescope from Meade is designed to take astronomy to the next level by providing a complete set up for viewing the planets and deep-sky objects like galaxies, star clusters, and nebulae. Three eyepieces provide 25x, 72.2x, and 103x magnifications with a 2x Barlow lens that doubles the magnification of each eyepiece for a wider-range of observing possibilities. This Polaris Right Ascension DC Motor Drive for Meade's Polaris series equatorial mount adds continuous RA tracking to the manual mount so you don't need to manipulate the RA slow motion cable which can cause unwanted vibrations. With the motor drive attached and turned on, the telescope can move at the sidereal rate to track any celestial object and keep it centered in your field of view. With the variable speed adjustment, you can quickly and easily change the speed to track the moon, planets, or sun as well as deep sky objects like galaxies and nebulae. The motor drive will keep the object in your field of view for 10 to 20 minutes before re-centering is required on a well polar-aligned mount. The motor runs for approximately 40 hours on a single included, and readily available, 9V battery. The drive is compatible with operation in either Northern or Southern hemispheres, and can be switched between the two simply by selecting the proper hemisphere on the N/S switch on the motor's front panel. It easily installs directly to the mount in under five minutes.